Words claimed to be “untranslatable” are often a tease. If they were truly untranslatable, we would have no access to them whatsoever. What makes many examples delightful is that, in fact, we can translate them. We won’t feel the resonance that the words possess for native speakers, of course, but we often have access to the core meaning in a way that provokes pleased surprise at unfamiliar packaging of ideas – and perhaps a smile of recognition. We Theory of Knowledge teachers collect words like that to enliven discussions of languages mapping out the world in different ways, and to stimulate student curiosity about some of the more profound differences — in language, and in cultural conceptions of the world. Would you like a few appealing words to add to your collection? Today, I have a couple of sources of such words to pass on to you. On this sparkling morning, my favourite is surely the Swedish word gökotta. It translates literally as “early-morning cuckoo” and means waking up early to hear the first birds sing. I hope it carries connotations of joyfully greeting a new day. Steve Mirsky, writing in Scientific American, has his own favourites, leading with the Inuit word iktsuarpok, which “refers to the anticipation one feels when waiting for someone, whereby one keeps going outside to check if they have arrived.” Mirky sees use for it, in his own cultural context, when anticipating a pizza delivery! He draws his examples from a cross-cultural linguistics study by psychologist Tim Lomas, a work of research in progress to which you and your students could contribute. The reader comments are also enjoyable, adding words and conveying some sense of their connotations. Another source not to miss is the illustrated list in The Guardian last year: “From mangata to kilig – 10 untranslatable words in pictures”. Writer Holly Young takes some of her own favourites from a book by Ella Frances Sanders. Among them are words that I realize I’ve always been missing. In Hawaiian at last I find – with a huge laugh of recognition — the very word I’ve needed. 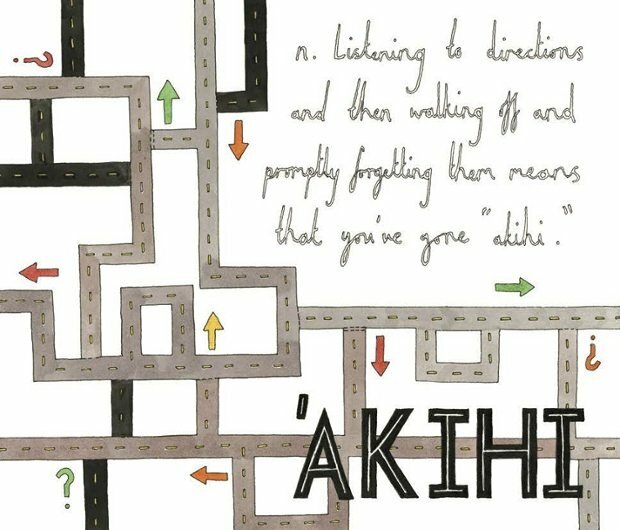 “Akihi: listening to directions and then walking off and promptly forgetting them.” So goodbye, for now. It’s still morning here, and, fortified by realizing that there are others out there like me, I’m off to try to find my way in the world. image: Ella Frances Sanders, Lost in Translation. Vintage Publishing, September 2014.